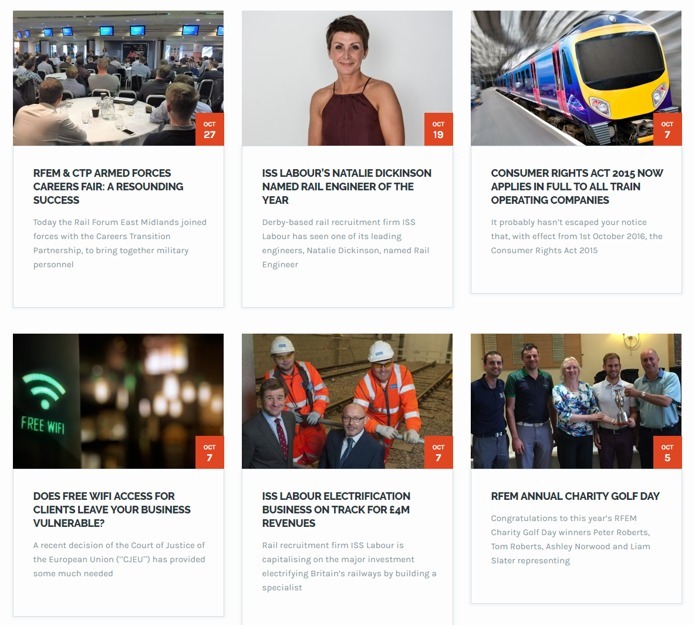 Rail Forum East Midlands (RFEM), formerly the Derby and Derbyshire Rail Forum, approached Primary Image to rebuild their existing website, which was in need of a complete overhaul. RFEM is a well known organisation in the rail industry, representing over 150 businesses in and around the Derby area, which has a long history of being a rail manufacturing centre. The Derby area reportedly has the largest cluster of rail-related companies in the world, with the city recently celebrating 175 years since the arrival of the railways. RFEM regularly meets with government ministers to raise awareness of the railway supply chain and its importance to the local economy. 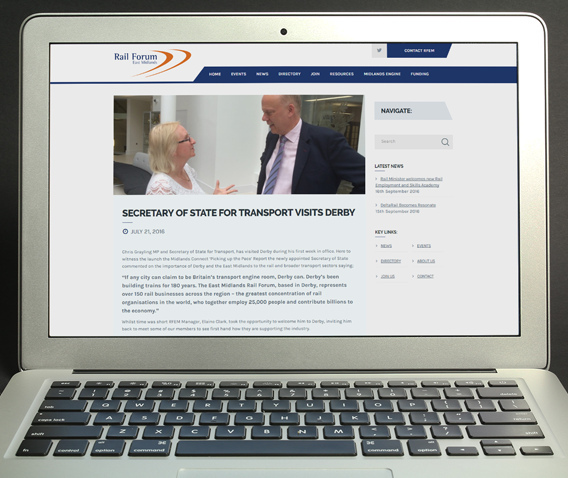 The old Derby and Derbyshire Rail Forum website, created by a Nottingham-based web design agency in 2011, was not mobile-friendly and it becoming difficult to maintain. RFEM decided it was time to rebuild their website, which would coincide with the launch of their new name and logo. The result was this modern-looking and uniquely styled web design, incorporating the bright, bold colours of RFEM’s new branding. We paid close attention to the detail in every aspect of the website design. In particular, with lots of different sections on the website, it was crucial that the home page layout and navigation menu were clearly structured to make everything easy to find. The website has news and event modules, with new content highlighted automatically on the home page. To ensure their previous news archive was not lost, we imported around 50 news articles from their old site. RFEM also wanted to make use of videos, which are embedded throughout the website. In addition, a members’ directory was included, which allows each of RFEM’s members to have a profile on the site. Each listing includes a logo, contact details, type of business and a description. Visitors to the website can quickly filter businesses into a specific category that they are looking for. A very important factor was that Rail Forum East Midlands wanted the back-end editing system to be as easy-to-use as possible. We built a customised WordPress installation, with every editing screen quick and intuitive to use. It’s even possible to update the website via a mobile phone! 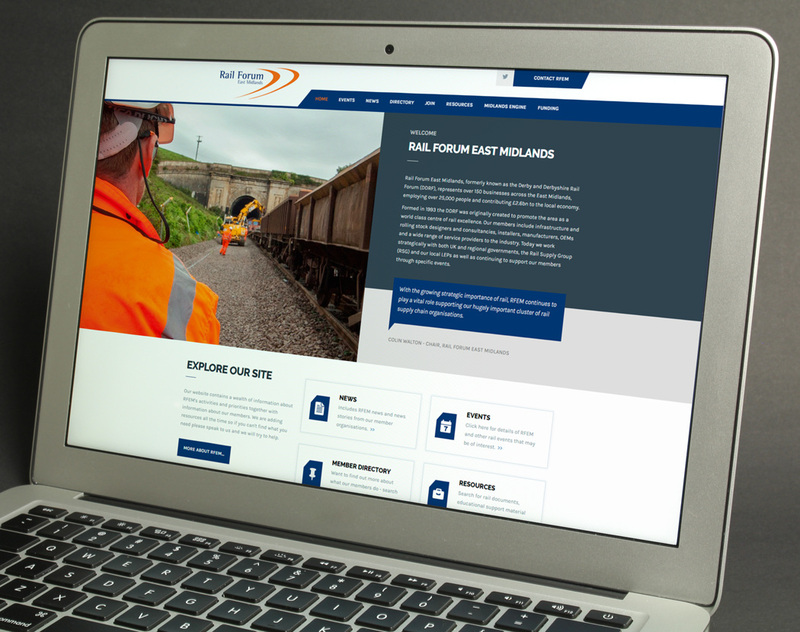 We really enjoyed working on this website rebuild for Rail Forum East Midlands. Their old website looked dated and was quite content heavy, so this rebuild has completely transformed their website. It’s now much more user-friendly and presentable. We’re very pleased that this new website provides a strong platform for RFEM to grow their membership base further. Please note: The website has since changed from the original design we created.